Featuring poetry by neo-futurist poets Serge Segay and Rea Nikonova! In Part I of Asymptote blog’s interview with Alex Cigale, Cigale discussed the roots of Russian Futurism, its modern inheritors, and politics at play in Russian poetry. Now he discusses his poetry and translations of Russian neo-futurist poets Serge Segay and Rea Nikonova. Read on for new poems by Segay and Nikonova, and to find out about Cigale’s Kickstarter campaign to finish exoDICKERING: Compositions 1963-1985, translated poetry by Serge Segay. Eva Richter: You’re a poet in your own right. Has Segay’s or other Russian Futurist poets’ work influenced your own writing? How do you see your work in relation to theirs? Alex Cigale: I am not sure the relationship is one of influence so much as of finding common affinities. I came to his work relatively late in my development, and at the time, I was editing, producing, and publishing five annual issues of a journal of “Found Texts, Found Forms” (called Synaesthetic). Having turned away from the biographic impulse of my earliest work, I was writing nothing but found poetry. One similarity I could point to is that, like my “found forms,” much of Segay’s work can be viewed within a similar formal structure; these appropriate the popular forms, such as recipes, instructions, directions, etc. ER: In addition to being a translator and poet, you are Asymptote’s editor-at-large for Central Asia. Does your engagement with Segay’s work relate to your editorial work at Asymptote? AC: I suppose, like Segay, both stylistically and geographically, I’m a rover. And Asymptote is all about parallels and tangents. The indigenous languages of Central Asia are proto-Turkic, but the lingua franca of the region (and the Cyrillic alphabet, if you include Mongolia) is Russian. And like Segay, I am part of the Russian international diaspora, so that my scope at Asymptote extends well beyond national and linguistic borders to include Russia “proper,” Siberia, the Caucuses and Baltics, other Slavic tongues, Scandinavia, and to some extent other parts of Europe as well. ER: Speaking of Europe, what is Segay’s reception like in Russia and other parts of the world? It is quite difficult to find information about him in English. AC: Practically nonexistent, other than the early Andrey Bely Prize you had mentioned (see part one). We have to admit that a readership for experimental literary work is a rather specialized one anywhere in the world. The situation is little better for the work of such great masters as Gennady Aygi and Mikhail Eremin (among others I am currently working on). ER: Segay’s “r e c i p e s o f m e t a m t e x t o s i s,” translated by you and published in Em Review, is a fascinating and complex poem; its language—childlike and explicit at once—has an interesting bodily quality and texture (for example, “best to can mature dear tomatings round or boobular in shape / with a dense meaty pulp / or prickly”). How would you characterize this poem? What line from it stuck with you long after you finished translating it? ER: Would you speak a bit about Segay’s wife, the poet Rea Nikonova, who passed away on March 10 of this year? You published Nikonova’s collaborations with the American poet Jim Leftwich a few years ago, correct? AC: Like the theatrical aspects of the work, this just needs to be seen for oneself. There are entire worlds of experimental writing, including concrete, conceptual, asemic movements; I would encourage readers to explore and seek it out for themselves. The covers of the magazine they had published together, Transponance, are available in the Sackner Archives. And the newer journal Hot Street will shortly be publishing selections of my translations of her early minimalist work, so perhaps it’s best to let her speak here, if ever so briefly, for herself. ER: Thank you, Alex. 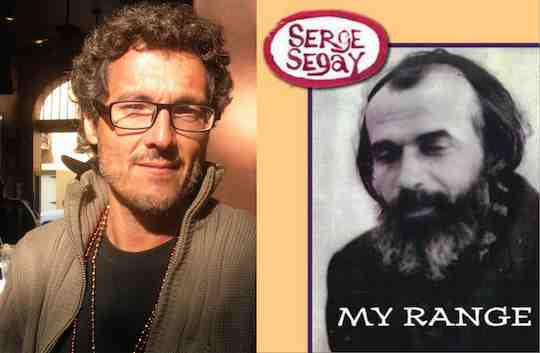 In closing, would you say a few more words about the Segay book project and share one of your Serge Segay translations? AC: Absolutely! Thank you, Eva! This work has been four years in the making. Miekal And of Xexoxial Editions had published Segay’s book of visual poetry some years back and got in touch with me, asking if I’d be willing to translate Segay’s selection of his own texts. My initial answer was, I couldn’t do it alone, but we were unsuccessful in finding anyone else willing to collaborate. In the following two years, I was able to recruit the assistance I’d already mentioned (Gerald Janecek and Dana Golin). Which brings me up to date: I see no alternative but to ask for the potential reader’s assistance to enable me to complete the translation and editing on the book (pledges of $30 will receive a signed copy of the book). And here is a short poem from the manuscript that is hopefully representative and apropos of the things I’ve spoken about here. The players form a circle: inside, the poser. the poser exercutes different kinesters. everyone must repeat these kinesters. the neo gives the blink-signal of the brain-leader. Read Alex Cigale’s poems in Asymptote here. Alex Cigale, Asymptote’s editor-at-large for Central Asia, was born in Chernovsty, Ukraine, and grew up in St. Petersburg, Russia, before immigrating to the U.S. in 1975. From 2011 to 2013, he was Assistant Professor at the American University of Central Asia, in Bishkek, Kyrgyzstan (formerly, the Soviet city of Frunze). His translations from the Russian are in Cimarron Review, Cortland Review, Colorado Review, Eleven Eleven, Interlit Quarterly, Literary Imagination, Modern Poetry in Translation, Narrative Magazine, New England Review (The Russian Presence,) PEN America, Brooklyn Rail InTranslation, The Manhattan, St. Petersburg, andWashington Square Reviews, and his own English language poems in Asymptote,Drunken Boat, Gargoyle, Green Mountains, North American, Redactions, Tampa, Tar River, and The Literary Reviews. You can read selections of the latter inFieralingue, Offcourse, and Qarrtsiluni.